Hey. So...I guess I wasn't as close to coming back as I thought. I am feeling a lot better recently, but life stuff keeps interrupting. Cleaning actually happens now. Weird, right? More on all of that someday. For now, I've got something you sorta saw if you read my previous post. Today's swatch was the undies for Sinful Colors Kissful Thinking. Brace yourself, it's a bit of an oddball. 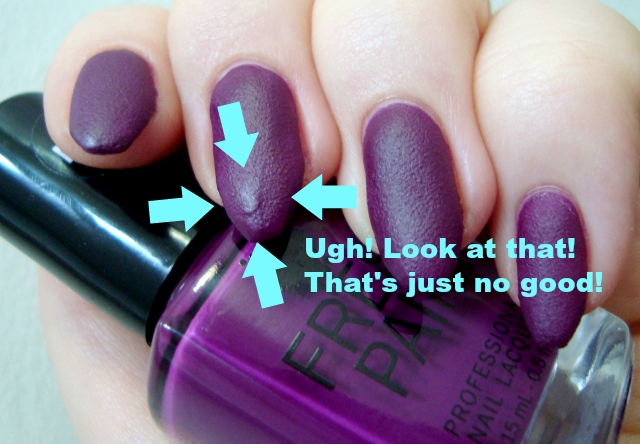 Don't Get Matte Get Even is a warm purple with a finely-textured satiny matte finish. For some reason, I couldn't get it to behave on my middle finger. I got a massive clumpy, lumpy mess. Yuck. The second try (first photo) turned out better, but you can still see glitchy little dents and bumps on 3:4 nails. Bleh. Bottom line: The color itself is gorgeous. The finish is weirdweirdweird, but the texture is fine enough that it smooths relatively easily with topcoat. Application was troublesome. Did you get this shade or any of the others from this collection? I couldn't find anything about what it might be called or how many there are. I wanna say three, maybe four. I saw some pinks and moved on.